Irish Record 19lb 3oz taken in 1904 by J.N.Hearne at Ballycotton. Pollack are similar in some ways and also regularly confused with Coalfish by newcomers to sea angling. However, they are normally different in colour, from a deep, kelp-red to a light golden-brown, bronze or sand colour. The lower jaw protrudes beyond the upper jaw. The eyes are larger than that of a Coalfish and the lateral line sweeps up dramatically just before the pectoral fin and up towards the eye. With a Coalfish, the lateral line is straight. This species can be caught anywhere around Ireland that has rock marks, reefs, pinnacles and Kelp beds. Deepwater wrecks are particularly good. They swim in shoals, are excellent predators and have a fantastic turn of speed when hunting their prey. Donegal on the North coast has produced many fine specimens over the years, some just under the long standing record. Although a few of these fish have been caught over inshore reefs most have been taken from deep lying wrecks well off the coast. Rathmullan, Port-na-blagh, Downings and Culdaff are well known harbours with access to these marks. On the east coast, marks out of Ballycastle and Portrush, such as the "Ridges" and the Shamrock pinnacles and further north-east over the Laconia Bank and reefs in the separation zone have all fished well for large Pollack in recent years. The South coast can be fabulous with many harbours on the Cork coastline offering access to wrecks and reefs such as East Ferry, Crosshaven, Cobh, Ballycotton and Kinsale. On up to the west coast and Killybegs, Dingle, Clifden, Achille, Belmullet and Sligo all give up large fish each year. Pollack are also caught whilst shore fishing from all the above venues and sport can be tremendous on light spinning rods. In general, Pollack will feed well in areas with good tidal movement. Look for isolated rock marks that jut out into the tide; this is where Pollack will be feeding. There are hundreds of headlands all around the Irish coast and good fishing can be had on most. This species can be caught most of the year round. The summer months are better for good numbers of fish ranging from 2lb - 6lb in weight. From the shore, the bigger fish tend to show in May and later in the year, around September time. Winter boat angling is more productive over the deep-water reefs and wrecks when weather allows. Pollack will attack most bait available. 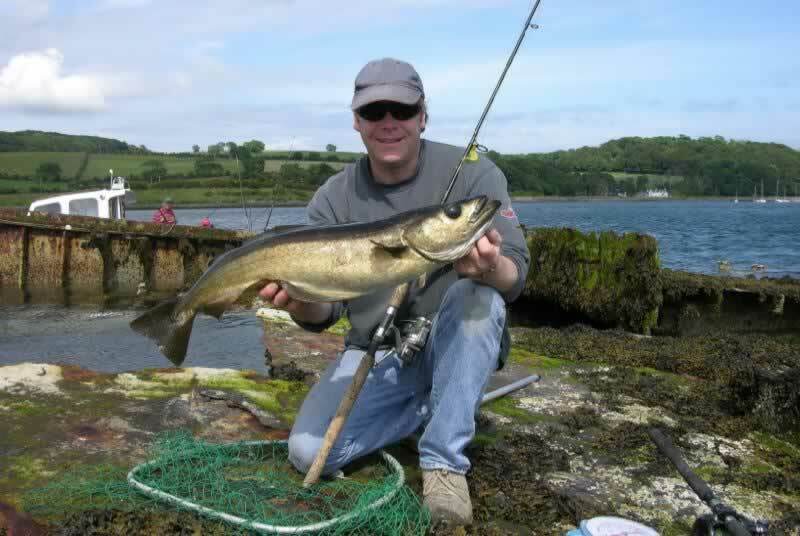 Spinning with artificial lures, shads, jelly worms and lead heads has become popular in Ireland taking many large fish on light tackle, however drifting and trolling using artificial Redgills is a very productive method. Ragworm on a flowing trace accounts for many fish and Mackerel-baited feathers are always worth a try. Spinning from rocky headlands or float fishing can be exciting, but the light tackle required makes it difficult to land Pollack. Their powerful dives into the kelp beds below tend to result in fish losses. Tackle needs to be reasonably powerful to stand a chance. Fly fishing can be heart stopping when a Pollack takes, but again, due to the nature of the terrain, fish over five pound are difficult to land. 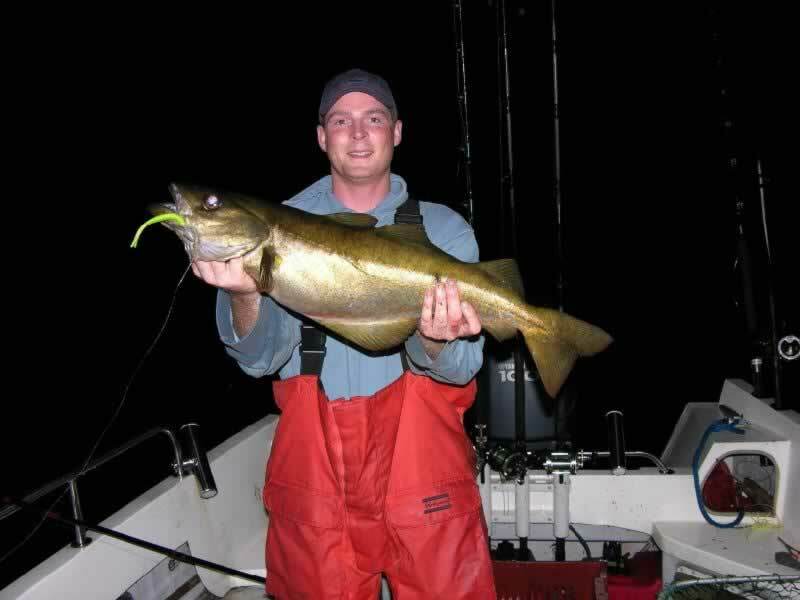 Boats offer a greater chance to land a big fish as the Pollack will follow bait up away from the snaggy areas and can be fought in open water to some extent.